Wanna Fact? Let's Be Fact Buddies! A single hurricane stirs up millions of miles of air and can dump more than 2.4 trillion gallons (9 trillion liters) of rain a day. Hurricane-generated waves frequently toss tons of fish onto beaches. The eyes of many of the fish have popped out because of sudden changes in pressure. Hurricanes produce enough energy in one day to run the lights of Las Vegas for many years. Christopher Columbus wrote the first known report of a hurricane in 1495. Hurricanes in the Southern Hemisphere spin in a clockwise direction. Hurricanes in the Northern Hemisphere turn counterclockwise. The word “hurricane” comes from Hurican, a name for the god of evil on some islands in the Caribbean. Ninety percent of all hurricane deaths result from storm surges, which can reach over 20 feet high and extend nearly 100 miles. In 1900, a hurricane in Galveston, Texas, killed more than 8,000 people, making it the deadliest weather emergency in U.S. history. Hurricanes kill more people than any other type of storm. A hurricane on Jupiter has been raging for over 300 years and is bigger than the Earth. The right side of a hurricane in the Northern Hemisphere is often stronger in terms of winds, tornadoes, and storm surge. Five of the 10 most costly hurricanes in the U.S. have occurred since 1990. Hurricanes have killed approximately 1.9 million people worldwide over the past 200 years. The deadliest hurricane on record is the 1970 Bhola Cyclone in Bangladesh, which killed between 150,000-300,000 people. Most of the deadliest hurricanes have occurred in southeastern Asia and India due to flooding on low-lying, densely populated areas. A hurricane makes “landfall” when its center, not its edge, crosses the coastline. The costliest hurricane worldwide is widely believed to be Hurricane Katrina, with overall damage estimates at over $100 billion. With 210 mile-per-hour winds at landfall, Hurricane Camille (1969) is the strongest hurricane to strike land. Typhoon Tip (1979), which did not strike land, is considered to be the largest, with tropical storm-force winds 1,350 miles in diameter. A hurricane can reach 40,000 to 50,000 feet up into the sky. Hurricane Andrew (1992) ripped an 80-foot steel beam weighing several tons off a building and flung it more than a block away. The largest hurricane can be the size of the state of Montana, 600 miles (966 kilometers) wide. Hurricanes never combine to form one stronger storm. However, the storms may circle each other, which is known as the Fujiwhara effect. 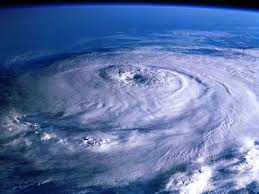 Hurricanes never form at the equator because they need the Coriolis Force, which is very weak at the equator, to spin. Although hurricanes can cause terrible damage, they are an important part of Earth’s complicated weather system. Like giant fans, they take hot air from the tropics and move it toward the poles. They help balance temperatures and moisture around the Earth. Without hurricanes and other storms, vast areas of the planet would be too hot for animal and human life. In A.D. 1281, a hurricane killed 100,000 Mongols who were attacking Japan. The Japanese thanked their storm gods for the kamikaze, which means divine wind from the gods. During the Galveston hurricane of 1900, nuns used ropes to tie themselves to rows of children in orphanages, but the floodwater was too hard and fast. People found the nuns still tied to the children after the flood. They had all drowned. There are several differences between hurricanes and tornadoes. First, hurricanes last several days; tornadoes last only minutes (or, rarely, hours). Hurricanes are on average about 2,000 times bigger across than tornadoes. As an analogy, if a tornado were as wide as a hamburger, a hurricane would be the length of an entire football stadium. Tornadoes have more intense winds than hurricanes. For example, the fastest recorded hurricane wind speed is approximately 200 mph. Tornado winds can be up to 300 mph. Hurricanes often spawn tornadoes. For example, Hurricane Andrew (1992) spawned 62 tornadoes, and Hurricane Beulah (1967) created a whopping 141 tornadoes. Tornadoes can occur days after a hurricane’s landfall. Hurricane names are chosen from a list selected by the World Meteorological Organization. There are six separate lists for Atlantic hurricanes, with one list used each year. Each list is repeated every 7th year. However, officials retire names of hurricanes that have caused a great deal of damage or death. Retired names include Andrew, Camille, Bob, Fran, Katrina, and Hugo. In 1953, the National Weather Service adopted the Navy’s practice of naming Atlantic hurricanes after women. Previously, hurricanes were named either according to their longitude and latitude or were identified by the phonetic alphabet (Able, Baker, Charlie, etc.). In 1979, meteorologists added men’s names to alternate with women’s names. The first three male names ever used for hurricanes (Bob, David, and Frederick) all are retired. Hurricanes spin around a low-pressure center called the “eye.” Sinking air makes this 20- to 30-mile-wide area calm and free of clouds. A thick ring of clouds called the “eye wall” surrounds the eye and is the strongest part of the hurricane. Though the eye is the calmest part of the storm, over the ocean, it can be the most dangerous area. While waves in the eye wall travel in the same direction, waves in the eye converge from all directions, which often creates rogue waves. Since pilots first began flying into typhoons and hurricanes in 1944, only four planes have been lost in the storms. No trace of these planes or their crew has ever been found. Water must be a certain depth for hurricanes to form, at least 200 feet (60 m). Additionally, the water must be warm, over 80º F (27 º C). A hurricane’s strength depends on how warm the water is—the warmer the water, the stronger the hurricane becomes. A tropical storm is classified as a hurricane when sustained winds reach 74 miles per hour, though hurricane winds are often faster. When a tropical cyclone’s sustained wind speed is between 39-74 mph, it is classified as a tropical storm. When its winds are less than 38 mph, a tropical cyclone is called a tropical depression. For a hurricane to form, there needs to be (1) a pre-existing condition disturbance with thunderstorms, (2) warm water (at least 80 º F) to a depth of 150 ft., and (3) light upper-level winds. Each year, approximately 10 tropical storms form over the Atlantic Ocean, Caribbean Sea, and Gulf of Mexico. Out of these, six become hurricanes. Approximately five hurricanes strike the U.S. coastline during an average three-year period. Of these, two are major hurricanes over 110 mph. Project Stormfury was an organization that tried to control hurricanes by seeding them with silver iodide, which would cool the hurricanes. However, the project had little success, and most scientists now have abandoned the idea of controlling hurricanes. Hurricane Andrew’s (1992) outer rain bands extended 100 miles from the center. In contrast, Hurricane Gilbert’s (1988) stretched over 500 miles. Hurricanes can last for weeks, but most hurricanes typically last approximately 10 days. During the 20th century, 158 hurricanes of all categories hit the U.S. Most hurricanes hit Florida (57), with Texas coming in second with 26. Louisiana and North Carolina each had 25. Thirty-six of the 64 major hurricanes (Categories 3-5) that hit the U.S. in the 20th century struck in September. August was the second busiest month, with 15. The Atlantic hurricane season typically lasts from June 1 to November 30, though most hurricanes form during the fall. The Eastern Pacific hurricane season is from May 15 to November 30. A hurricane warning is issued when a hurricane is expected to arrive within 24 hours. A hurricane watch is issued when the storm is 24-36 hours away. The years 2000-2009 have seen the most Category 5 hurricanes, with eight. These include Isabelle (2003), Ivan (2004), Emily (2005), Katrina (2005), Rita (2005), Wilma (2005), Dean (2007), and Felix (2007). Earthquakes outnumber hurricanes. According to NASA, approximately 85 hurricanes, typhoons, and tropical cyclones occur worldwide each year. According to the U.S. Geological Survey, there are 500,000 detectable earthquakes in the world each year, with 100,000 strong enough to be felt and 100 of them strong enough to cause damage. The Southern Hemisphere typically experiences about half the number of hurricanes as the Northern Hemisphere each year. No hurricane is on record as ever hitting the U.S. Pacific Coast. Hurricanes have, however, hit the West Coast of Mexico. The number of Atlantic hurricanes is increasing. The 2005 Atlantic hurricane season, for example, was the worst on record. Some scientists think the rise in hurricanes is due to a natural cycle: hurricanes are rare for the first 30 to 60 years of the cycle and then they become more common for the next 30 to 60. Other scientists blame global warming. Hurricane/Typhoon John lasted 31 days in 1994, which is longer than any other hurricane in history. It was both a hurricane and a typhoon because it passed through both eastern and western parts of the Pacific Ocean. It is a common misconception that opening all the windows in a house during a hurricane will equalize the pressure in the house so the windows won’t explode. Experts argue, however, that opening the windows will only weaken the house by allowing more wind, rain, and debris to fly in. SARS, tsunamis, influenza, swine flu, and also the first ever true global economic collapse.